Jerusalem (Agenzia Fides) - The condition of "misery" in which the Palestinian populations live in the territories occupied by Israel "has been deepened by severe cuts to humanitarian funding by the US government". This is what the Bishops of "Holy Land Coordination" highlight, who in recent days made their traditional annual pilgrimage to the lands where the earthly life of Christ took place. This year the delegation was made up of 15 Bishops from Europe, Canada, the USA and South Africa, and was led by Englishman Declan Lang, Bishop of Clifton and current President of the Coordination. 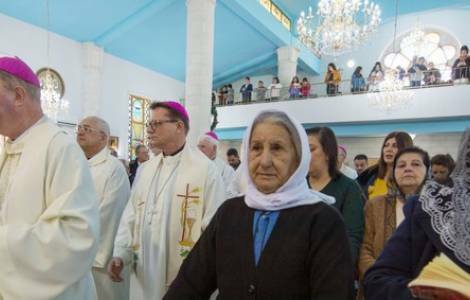 "Healthcare, education and other basic services for refugees" reads the final communiqué signed by the Bishops at the end of their visit, "are being increasingly threatened, exacerbating the ongoing violations of their fundamental human dignity. This cannot be ignored or tolerated". In the text, the Bishops call upon their own governments to "help meet the funding gaps now faced by the United Nations Relief and Works Agency (UNRWA) and redouble efforts towards a diplomatic solution, with two democratic sovereign states of Israel and Palestine existing in peace". Regarding the condition of the Christian communities in Israel, the Bishops of the Coordination found that "Israel’s Christians wish to live as full citizens, with their rights recognized in a plural and democratic society", but at the same time, many of them "find themselves systematically discriminated against and marginalized".